It's kind of terrifying to adapt something because you're not just adapting the thing in question. You're trying to adapt the aura of it; some books have this indefinable something about them that you can't ever pin down in words, but you know it's there. And even little white girls growing up in rural North Yorkshire knew that there was a something about To Kill A Mockingbird. I cannot speak for the text itself, nor for its nuanced problems and challenges which better voices than I have elaborated on, nor for its cultural status, but I can speak for this adaptation itself. The care of it, the craft of it, and the curious way that it is neither graphic novel nor book but rather something in between. I would call it more of an illustrated novel, rather than a graphic novel. The difference is fine, I know, and probably something I'd struggle to describe to you were I pushed, but it's there. The lettering uses the same font throughout for example, a calm steady consistent font that doesn't vary by character or panel. It gives the book a great sense of intimacy but also adds this strangely intriguing sense of remove. We see what we're told to see, read what we're told to read, and the text itself? 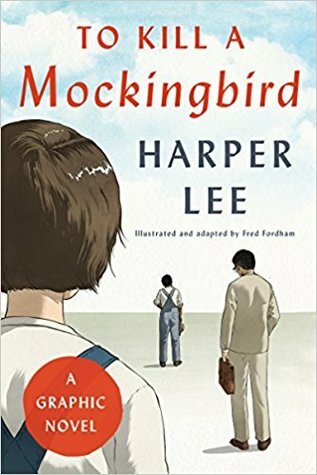 Well, that felt distant - even now, even despite the great embedded cultural weight that To Kill A Mockingbird holds within the world. I find that intriguing; that a story so well known can still hide away, just a little, just enough. This is a beautifully produced book and Fordham's aesthetics here are wonderful. He draws a lot from the film (particularly, I thought, with his interpretation of Atticus), and situates him within a town full of quiet, soft colours. I rather loved his use of frames; a vast amount of his panels are un-edged, merging softly with the book itself and giving the whole page a sense of timelessness. Those that are framed are rare but potent, introducing a note of dynamism and sudden focus. It's a quality piece of work. It is, however, a clear adaptation. It's not a repurposing, nor a retelling, nor a questioning. It's adapted. Deliberately. Carefully. Perhaps a little too carefully at points but again, understandably so. It's also important to note that stylistically I felt that it reached down towards the younger end of secondary but the text itself retains the use of the n- word and the themes located therein. It's perhaps something then to read in company with the text itself, or rather with the facility to discuss and challenge and think about some of the content. Sign into Goodreads to see if any of your friends have read To Kill a Mockingbird.